Boats… not exactly a love affair of mine. I have a few too many stories involving uncomfortable or dangerous ferries, large waves, and, well, vomiting! This one wasn’t all that different! I took a boat from Knysna on the coast of South Africa; the harbor is in a very calm lagoon, with only a narrow passage out to the open water (known as the Knysna Heads). As soon as we got out – big swell accompanied by the usual nausea! 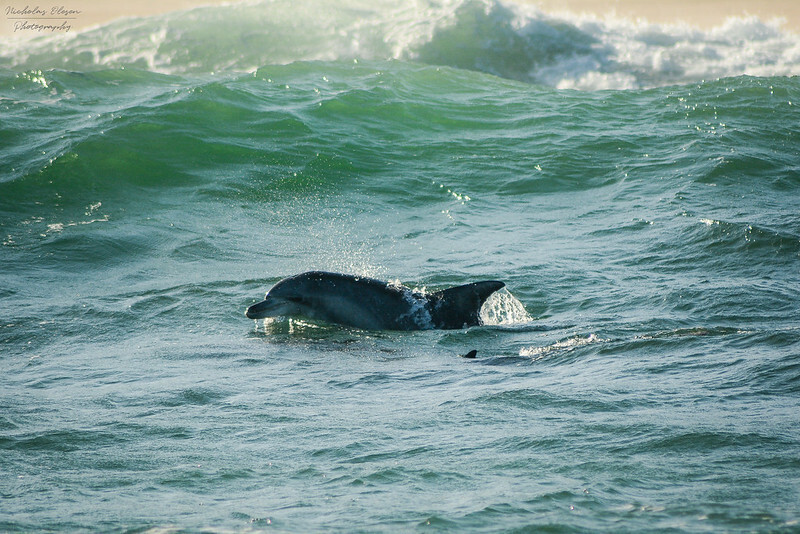 But it was worth it – we saw seals, an African penguin, plenty of bird life, and a pod of bottlenose dolphins feeding in the waves just off the beach nearby. It was difficult to take pictures with the big waves, but I managed to get the timing and framing just right with this one.